“It took me a while to connect to dots, to figure out that my promiscuity wasn't me asserting control over my own body. I suppose for some people it might be, but there came a day when I had to wake up and face up to the fact that I was giving too many other people control over my body." “Any guy who thinks less of you for your past doesn't deserve to know you. You're better off without him." “But I learned something that summer. I learned that it's okay to be yourself, even if you're completely weird, and the people who matter in your life won't hold it against you. I decided to get to know myself a little better and stop trying to be who others wanted me to be." “But it's not fair. I only just figured out how to actually not do the stuff people forbid me to do." Rock-stars. Boy Bands. What's not to like? I am such a HUGE fan of E.M. Tippetts. I have read every single one of her books,plus reviewed them. She is one of my favorite E-Book authors so I was super excited when she asked me to review her latest book "Break It Up" She even sent me a paperback copy. Score!. The synopsis of this story is pretty simple. Kyra is a reformed wild child who happens to get the amazing opportunity to have dinner with the band "Triple Cross" They are the coolest boy band around and everyone wants them. Kyra invites a few of her friends to go with her and the evening starts out well, that's until Kyra wakes up the next morning in her crushes bed. If you have read "Someone Else’s Fairy tale" or "Nobody’s Damsel" by Emily Mah Tippetts, Kyra would be familiar to you. Break it Up is a spin off focusing on Kyra,Jason’s niece. She’s not the wild child she was in those books, but rather maturing and coming into her own. Kyra owns her own mistakes but is trying to leave it in the past and make something of her future. Kyra's character was so real to me. Who hasn't made mistakes as an impressionable teenager and wished to right their wrongs? Obviously Kyra has it a bit harder as she is hanging with celebrities and the paparazzi are just ruthless. I thoroughly enjoyed seeing some of the main characters from Emily's previous books in the background of this story. It made the book feel like an old familiar friend. That doesn't mean that you need to read Emily's other books to enjoy this one (although I would reccomend both of them). At first the idea that Triple Cross was a boy band that had just fired their main manger, who happened to be their mom, made me believe that I might be a bit too old for this teenish tale. I was wrong. The focus is on the band relations and how growing up is hard whether in the spotlight or just as a regular girl. I felt the author did an amazing job of portraying the interactions between the band members, the crew, the bands new manager and their interactions with Kyra. The story flowed really well and I found myself highlighting many poetic moments through out the dialogue. I can now add this to my list of Emily Tippetts books that gets a solid 5 stars from me. Although many characters in this story were flawed, Emily made each one of them come to life for me instantly upon opening the page. I loved the fact that authors can still write amazing new adult novels without always having to be raunchy with words or scenarios. The story is fresh, clean and gives a perfect ending to a beautiful story. 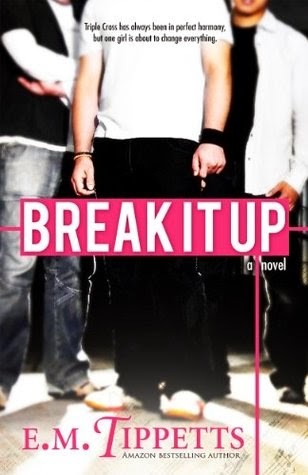 What you can win: A signed copy of Break It Up and a temporary tattoo of the scene break graphic. Emily Mah Tippetts writes romance under the name E.M. Tippetts and science fiction and fantasy under the name Emily Mah. Before she was a published author, she was an attorney who specialized in real estate, contracts, and estate planning, especially literary estate planning. Her most recent pro publications have been her science fiction and fantasy short stories in magazines like Black Gate, Analog Science Fiction and Fact, and the anthology, Shanghai Steam.